This weekend was pretty fantastic for a number of reasons. 1. 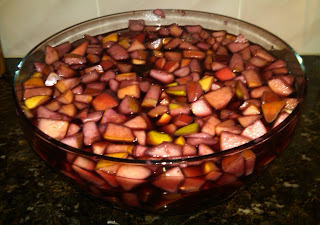 The sangria at my housewarming party was a success. 2. I had a 3-course homemade breakfast today. 3. I finally finally hunted down Haagen Dazs' Caramel Cone ice cream. (Thank you, Union Square Duane Reade!) 4. I had an amazing milkshake & got to spend an entire day out and about with the roomies. My best friend sent me a sangria recipe she tried before, and although I debated for a while whether to use this recipe on Wine Intro that calls for 10 ingredients versus the one my sister found on Real Simple that only has 3, I decided that the Wine Intro one would be prettier, and since my lovely roommates would be helping, why not go all out. I'm very happy with how it came out. I doubled the recipe and it was enough for 12 people. Since it's fall already, some of the fruits weren't available. I used pears instead of peaches and added in an extra apple in place of the orange. Prepare a large pitcher or bowl. Pour in the red wine, brandy, triple sec, and sugar. Add in the wedges of orange, lemon, lime, red apple, and peach. Stir well. Allow the mixture to sit and soak for 2 hours or more. Overnight works best. When you're ready to serve, add in the club soda and add in fresh ice. To turn this into a single-glass sangria recipe, a typical assumption is that one 750ml bottle of wine yields four large glasses of wine. Divide all ingredients shown by four. If you're making just one glass worth you probably don't want to wait for the overnight soaking. If the mixture doesn't soak, you just won't get as much of the fruit / berry flavors permeating the sangria. Who's your "best friend" biatch?